So you are all out of cornstarch and are in need of a quick replacement. Fear not we have chosen the five best items as a cornstarch substitute that you are most likely to have at home. Most of you will probably already have these substitutes for cornstarch already in your kitchen. You might not have all of then but are bound to have a couple. When looking at your options for replacing cornstarch in your recipe what to use in place of cornstarch will depend on what you are making and how the replacement may effect the finished dish. Arrowroot’s neutral flavor and gluten free status has made it a favored thickening agent of the past few years. Given that it shares these two important attributes with cornstarch it is easy to see why arrowroot is one of the most popular substitutes for cornstarch. Derived from the root of the South American plant of the same name arrowroot powder it is commonly used as a thickening agent in sauces and soups. It is basically odorless and is a very fine white flour like substance. 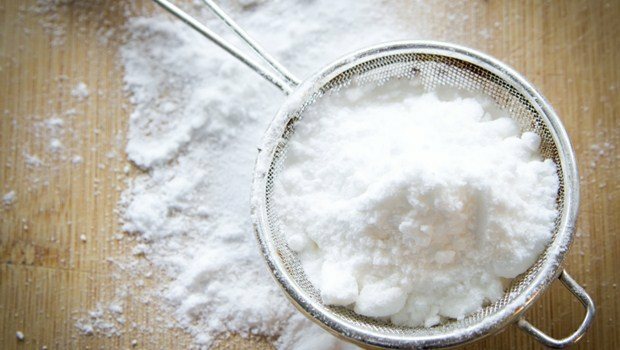 What are the differences between arrowroot and cornstarch ? Arrowroot has a tendency to thicken at lower temperatures than that of cornstarch. So, before you add to any kind of hot liquid you should really create an arrowroot slurry first. Similar to a cornstarch slurry you should then slowly add the arrowroot slurry to the hot liquid. Try to avoid adding it to boiling liquids, so if you can for a short while(and it won’t affect the cooking process) remove the hot liquid from the stove until it stops boiling and then add the arrowroot slurry whilst stirring consistently. Also, you may want to refrain from using it with dairy based sauces. It can tend to turn a little bit chalky when mixed with milk or cream. Just like for arrowroot, tapioca is an excellent replacement for cornstarch. Tapioca flour just like cornstarch is an extracted starch, however it is processed from the Cassava plant. Cassava is a root vegetable commonly found throughout South america. It makes for a good thickening agent as the starch is capable of absorbing slightly more water than a lot of other common thickeners. This makes it especially suited for use in pies, leaving you with a nicely dry and crisp pie. It has less of a floury texture so it is also quite suitable for baking. Is corn meal the same as corn starch ? Cornmeal differs greatly from cornstarch in that it is dried corn that has been coarsely ground into a “meal” like consistency. Cornmeal retains it’s corn flavor and yellowish hue. It is most commonly found as the main ingredient in grits or cornbread and can be added to the tops of bread or cakes to add a nice crunch. Is cornstarch the same as cornflour? Well that depends on where you are from. This can lead to quite a considerable bit of confusion especially if you are looking at recipes from the different countries. In the UK and a few European countries cornstarch and cornflour refer to the same thing i.e the extracted starch from corn. However more commonly in the US cornflour is nothing more than finely ground cornmeal. And cornstarch only refers to the starchy extract used for thickening. The two starches can be used and prepared in almost the same manner. However potato starch will tend to thicken a little quicker, and it will also thicken at a lower temperature. Potato starch as a cornstarch substitute works best in sauces as it remains pour-able and has less tendency to set into a gel versus cornstarch. It is best not to add potato starch to boiling liquid. Ideally you will take the sauce off the heat and allow to cool for a few minutes before adding the potato starch. Ordinary wheat flour is probably the worst substitute for cornstarch on this list. As it is made from wheat it contains gluten so if the recipe is a gluten free one then flour is an immediate no. You will also need roughly twice as much wheat flour as cornstarch so this may change the flavor significantly. You may end up with a sauce that is much thicker than you originally intended if you use flour.